Conductive education is an intensive, multi-disciplinary approach to education, training and development for individuals with cerebral palsy, spina bifida and other conditions with neurological challenges. Though first developed decades ago, it has gained prominence in North America in the last 15 years. The goal of this treatment is to leverage a combination of medical knowledge and education methods to help children with disabilities to gain control of their motor functions and become more independent. Conductive Education (CE) was initially developed in Hungary in 1945 by Dr. Andras Peto. In Peto's belief, the disintegrated function characterizing a child with disabilities can be overcome through an indirect cognitive route involving teaching and learning. As a result, the rehabilitation plan is more effective when focused for the individual, not the function. The Strive Learning Centre for Children utilizes this comprehensive approach in its intensive form of rehabilitative therapy. According to them, "when children with Cerebral Palsy spend much of their lives being treated as sick and incapable, they learn very early on that they must look to others to meet their needs instead of developing the belief in themselves that is so central to the development of well adjusted, happy individuals who participate in society." 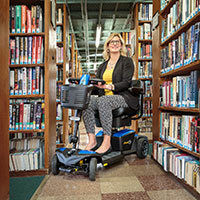 CE uses active learning to reduce the physical effects of a disability. A typical curriculum pairs physical activities with cognitive tasks, and takes place in a group setting to facilitate greater socialization. The goal of this structure is orthofunction, or the ability to successfully tackle the challenges of daily living—things like dressing, eating, bathing, teeth brushing, and other activities that, once mastered, will allow a child to live and function as independently as possible. Strive maintains that a child's self-image is ultimately harmed when he or she is constantly treated as the "special" or "sick" one. Conversely, regular access to the CE style of learning prepares a child for successful inclusion into mainstream school, home, workplace and community. This approach boost their skills and confidence, and paves the way to their future. For more information about Strive Learning Centre for Children, visit striveforchildren.org or meet them in person at Abilities Expo Toronto.